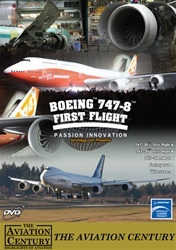 Boeing 747-8 First Flights DVD. AirUtopia takes you on an exclusive adventure to witness one of aviation's biggest events of recent time, the momentous first flights of the Boeing 747-8F and the 747-8I ! This DVD also includes interior tours of the 747-8F and 747-8I, pilot press conferences, the spectacular 747-8I rollout ceremony and the aircraft's first overseas appearances at the 2011 Paris Airshow!